In simple words, React.js is a "V" in the MVC web architecture. Unlike large front end frameworks such as Angular or Backbone.js, React can render large amount of data on the webpage really fast. 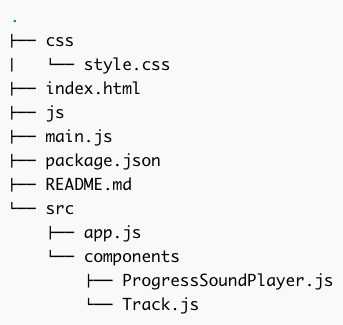 For example, React.js devides the webpage by components. So whenever you press like button facebook page, only that Button components gets updated on the and where everything else stays the same. So, lets get to the Tutorial. We are going to create a Music Streaming App by utilizing the electron.atom.io starterkit. Now, lets customize the package.json file for our needs. Now, we can work on the React components. And for the ProgressSoundPlayer, the code will be looking like this. We will be creating a Main component and mount the Main component on index.html. First we will import some library and necessary components. query is the default search query. hasResults is used for tracking whether the component currently has any results from the API or not. searchResults stores the current search results. isLoading is used for tracking whether the app is currently fetching results from the API or not. When this is set to true, the spinner becomes visible to indicate that there’s something going on. Then we have handleTextChange function. ​This is used for updating the value of query in the state and also calls the search method if the Enter key is pressed. Now, its time to render something on the screen. Before we do that, we have to use bind() for the handleTextChange method and call() for the renderSearchResults and renderNoSearchResults methods. This is because methods in React aren’t automatically bound when using the ES6 class syntax. By, default, this component gets rendered, since there are no search results. When we have some search result renderSearchresults() method gets called. This calls the map method in the searchResults to loop through all the results and execute the renderPlayer function for each iteration. The renderPlayer function accepts the individual track object as its argument. We use it as a source for the key and resolveUrl props. If you’ve worked with React in the past, you already know that when using the map method to render a list, we always have to pass a unique key or else React will complain. The other two props: clientId and resolveUrl are required by the ProgressSoundPlayer component. The clientId is the SoundCloud API key which you defined earlier and the resolveUrl is the unique URL that refers to that specific audio track. It’s the same URL that you get when you visit the page for a specific audio track on SoundCloud.